This is my take on a favorite dressing that Executive Chef Jim Cox makes and is only sold in Ohio. I live in Texas, so I decided to make my version of it. A must for making this dressing is the sweet balsamic vinegar from Spicewood Food Company, which can be purchased online at Spicewood Food Company . 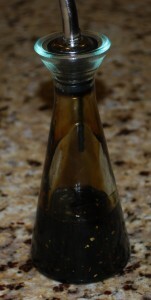 The reason for using Spicewood Food Company Balsamic Vinegar Aged 18 Years is that it is like a balsamic reduction which is sweet and smooth. Makes about 1/2 cup. Whisk together first 6 ingredients and slowly whisk in extra virgin olive oil. Enjoy on your favorite Italian style salads!